Made of high quality colored polycarbonate (PC). For use with liquid nitrogen. 5150001 Cryo-Boxes, PC, grid 9 x 9, blue, 132 x 132 x 52 mm 5 pc. 5150002 Cryo-Boxes, PC, grid 9 x 9, green, 132 x 132 x 52 mm 5 pc. 5150003 Cryo-Boxes, PC, grid 9 x 9, red, 132 x 132 x 52 mm 5 pc. 5150004 Cryo-Boxes, PC, grid 9 x 9, yellow, 132 x 132 x 52 mm 5 pc. 5150011 Cryo-Boxes, PC, grid 10 x 10, blue, 132 x 132 x 52 mm 5 pc. 5150012 Cryo-Boxes, PC, grid 10 x 10, green, 132 x 132 x 52 mm 5 pc. 5150013 Cryo-Boxes, PC, grid 10 x 10, red, 132 x 132 x 52 mm 5 pc. 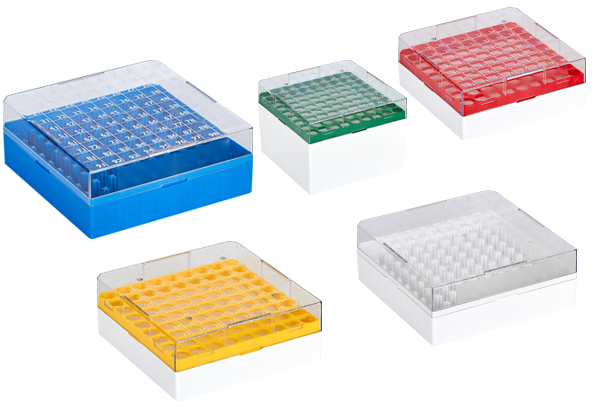 5150014 Cryo-Boxes, PC, grid 10 x 10, yellow, 132 x 132 x 52 mm 5 pc. 5150015 Cryo-Boxes, PC, grid 10 x 10, white, 132 x 132 x 52 mm 5 pc. 5150021 Cryo-Boxes, PC, grid 9 x 9, blue, 132 x 132 x 94 mm 4 pc. 5150022 Cryo-Boxes, PC, grid 9 x 9, green, 132 x 132 x 94 mm 4 pc. 5150023 Cryo-Boxes, PC, grid 9 x 9, red, 132 x 132 x 94 mm 4 pc.